Infusionsoft is the first to marry email marketing and CRM into a single application that is driven by a powerful automation engine. Merchant account and affiliate marketing services. CREmodel is an easy to use, affordable yet powerful Excel based financial model for all types of commercial real estate projects – shopping centers, apartments, office, industrial and mixed use. 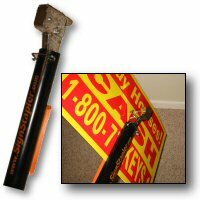 Super Cheap Signs has been helping real estate investors dominate their markets for years. We understand how you work, what’s important to you and what you need in a super cheap sign. Super Cheap Signs can help you get the exposure you need to be successful. PATLive offers a wide range of telephone answering services. Our automated services are complemented by a live answering center that is always open. With PATLive, your customers can reach a live receptionist when you want them to. Signs placed at ground level with H-Wire Stands don’t have a chance, and get pulled like weeds. If you want your signs to stay up longer, just remember this basic rule…”higher is better”. The harder is your sign to take down the longer it will stay up.